This is a K2 luxeon LED flashlight powered by two C123 lithium batteries. The light is 4.8'' long with a 1'' diameter. It is quite slim for a two cell light, the body is made of anodized aluminium with a knurled body to aid the grip. The switch is a clickie with momentary activation possible pressing lightly. The light uses a collimator lens to focus the beam in a very tight spot, this makes the beam appear like a square at close distances it is a light designed for throw with very little sidespill. The runtime is about 1 hour at maximum brightness and then 3 or 4 extra hours at reduced brightness, how usable this dimmer light is depends on every user, after 4 hours the LED is still on but very dim so we wouldn't say it has any real use except as maybe a locator. If it is used in constant on mode the flashlight body will get very very hot after 10 or 15 minutes of use. Advertised as a tactical flashlight with 130 lumen we have to say this is not a tactical light and it is not 130 lumen either, our calculations reach about 80 to 85 lumen. To be a tactical light the switch would have to be silent and turn off if the light is dropped, there will have to be an anti-roll mechanism and the body would have to be a stronger aluminium not just simple anodization. This doesn't mean we don't like the light, it is probably a very nice light and for $39 getting a 80 lumen light designed for throw is probably a good deal. It would be even nicer if it wasn't advertised as it is but manufacturers have a strange way to understand their public. 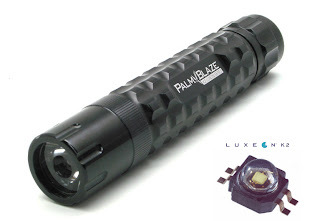 With the new Cree LED lights in the market the PalmBlaze K2 is probably a little outdated it is good thrower light designed to illuminate distant objects with aceptable runtime and a reasonable price but for just a few extra dollars you can get something brighter and with multiple brightness levels. You can order for $39 from Battery Junction.